Foxley is a parish in the centre of Norfolk within the Breckland district. It is south of Foulsham and north of Bawdeswell. The village name derives from Old English and means 'woodland clearing frequented by foxes'. This continues to be appropriate - Foxley Wood (NHER 25459) in the northeast of the parish, is an important example of managed woodland and is operated as a nature reserve by Norfolk Wildlife Trust. It is the largest area of managed woodland within Norfolk. The importance of the woodland to the village is also highlighted in the Domesday Book where the village entry includes the presence of enough woodland to support 300 pigs. The inclusion of the village in the survey suggests that it probably has Saxon origins. The archaeological evidence from the parish, however, includes records of finds dating from the Neolithic suggesting that there was activity in the parish from much earlier than the Saxon period. The earliest prehistoric finds date to the Neolithic. A flint Neolithic axehead (NHER 7196) has been recorded as coming from here. Another worked flint, a flake (NHER 42643) formed when working a tool, is prehistoric, but it is impossible to date it any closer than this. There is also evidence for activity in the Bronze Age. Two Bronze Age palstaves (NHER 32144 and NHER 37664) have been found here, one of which was incomplete (NHER 37664). 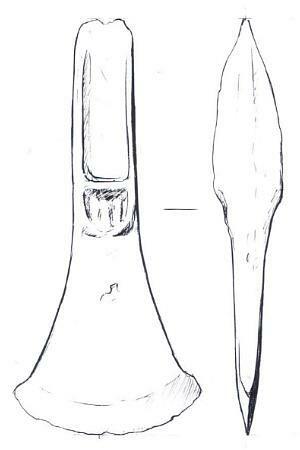 Flint tools were also used in the Bronze Age, despite the introduction of metal tools and weapons, and a Beaker period or Bronze Age barbed and tanged arrowhead (NHER 3140) has also been found in the parish. Although several prehistoric finds have been made in Foxley there is an absence of prehistoric monuments. This does not, however, necessarily indicate an absence of people or settlement. Few archaeological excavations have been carried out and it is possible that more evidence lies beneath the ground waiting to be discovered. 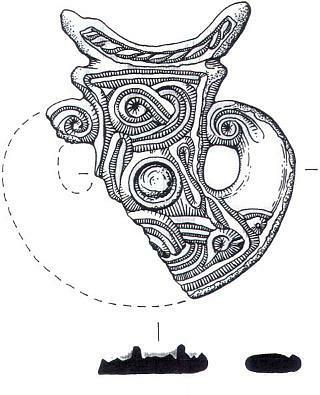 A similar pattern can be seen in the finds from the Roman period. Several finds have been made, but there is no evidence for settlement or structures despite the presence of a Roman road (NHER 2796) that forms part of the southern boundary of the parish. Roman pottery (NHER 7197, 36599 and 42643) is a fairly frequent find and has been collected by fieldwalkers and metal detectorists. Roman brooches and coins (NHER 31561) and a Roman clothing fastener (NHER 31599) have also been recovered. A silver ring (NHER 7198) may have slipped from a lady's finger whilst it seems more likely that a small hoard of 1st and 2nd century AD Roman silver coins (NHER 35692) was buried in the ground on purpose. The earliest evidence for settlement and structures in the village date from the Saxon period - tying in very nicely with the old English derivation of the name. Part of St Thomas' church (NHER 7221) is built of large blocks of conglomerate and this suggests that there may have been a church on the same site in the Saxon period. The documentary evidence also suggests that Foxley Wood (NHER 25459) was an important resource used by the local population at this time. Other evidence for the Saxon period is gathered from the metal detected finds from the parish. These include some excellent examples of Early Saxon metalwork. A lovely 7th century mushroom-shaped mount (NHER 33866) with two birds on it would have been worn on clothing as a personal ornament. An Early Saxon cruciform brooch (NHER 31561) and a small Early Saxon long brooch (NHER 35697) have also been recovered. By the medieval period the woodland (NHER 25459) was being actively managed. Some of the oak trees in the wood today have been there for over 800 years and have been successfully coppiced throughout that period. St Thomas' church (NHER 7221) was mostly built between the 13th and 15th centuries and it is in 1305 during the 14th century that the manor of Bigod is recorded in documents. The site of this large manor may have been identified. A large rectangular medieval moat (NHER 7214) can be seen on aerial photographs taken of the parish and it has been suggested to be the site of Bigod's manor. Some of the moat is still water-filled and the old trees growing around it are still actively managed and coppiced. Metal detectorists have also recovered medieval finds. Several examples of fine medieval shield-shaped horse harness pendants (NHER 35715 and 32352) have been identified. In some cases the survival of the gilded and enamelled decoration is so good it is even possible to identify the coat of arms of the owner of the harness pendants. A possible fragment of a pilgrim badge (NHER 35697) has also been examined. If indeed it is a pilgrim badge it is an unparalleled example - no others exactly like it have been identified. Several post medieval buildings are still standing within the village. The oldest recorded building is the former Chequers Pub (NHER 19249). Although this has a fairly conventional 18th century exterior inside are carpenters' marks and an inscription dated to 1624. Foxley Mill (NHER 15412) was an interesting 19th century brick tower mill. An intriguing building is the probable 19th century thatched icehouse (NHER 16983) with triangular windows. Although this has been suggested to be a dovecot it seems more likely to have been an icehouse. It would have been used to store ice and keep it cold before the invention of the freezer! Several Evans Lombe estate 19th century farms (NHER 44351, 44352, 44353 and 44354) laid out in a E-shaped plan also survive. The most recent archaeological site recorded in the parish is the site of a World War Two plane crash (NHER 20528). Two American bombers, part of the 392nd Bomber group, stationed at Wendling crashed here during the 1940s. Megan Dennis (NLA), 9 December 2005.
http://www.norfolkwildlifetrust.org.uk/big%205/foxley.htm. Accessed 9 December 2005.
http://www.norfolkmills.co.uk/Windmills/foxley-towermill.html. Accessed 9 December 2005.
http://bawdeswell.net/rtwebsite/villages/Foxley/30f.htm. Accessed 9 December 2005.